* Increasingly crazy Enders, including one wearing a toilet seat for a headdress. * The gang try to talk Warren out of her quest, but she's not having it. Also, she doesn't think she's psychic. * Lucy and Murphy clashing over treating zombies with basic human decency. * Murphy's 'cure' seems to be devolving in creepy and gross ways, which makes sense given that none of the other Zona cures held up. * Lucy can sense Warren. * Z-rats are not a thing, and that rat ender had style. * Kaya's around, she's a mom and Citizen Z is still missing. 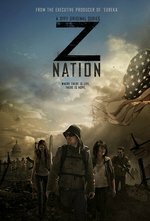 I had completely forgotten about the Citizen Z plot (as had the writers I'm guessing). I was expecting more payoff than that from the antennna, especially with that shot of Warren's hand in some type of rigged-up glove. Why isn't this a box set that I can binge watch RIGHT NOW? Wareen's deja-vu comment didn't make sense. I had completely forgotten about the Citizen Z plot (as had the writers I'm guessing). Yeah, that read as a flashback, not deja vu. And I agree: I'd binge this if I could. Where did Warren get that one armed catsuit?